Mounting Hole Cable Ties | Mounting Hole Zip Ties | Cal Fasteners, Inc. The one-piece construction of these mounting hole cable ties makes mechanical mounting faster and easier. They are designed to secure and position wire bundles, cables, hoses, and more to panels or other surfaces with a single mechanical fastener. Cal Fasteners stocks mounting hole cable ties in 30, 50, and 120-pound capacities and in numerous lengths to meet your needs. Available in natural or UV-treated black nylon. High quality materials and special pawl, teeth, and transition rail designs improve tensile strength. Low insertion and pull through force makes installing and tightening these zip ties quick and easy. Finger grips and tapered tails make handling and alignment simple. ROHS compliant. 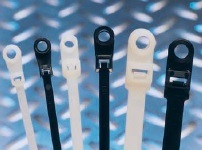 We also offer standard cable ties in 30, 50, and 120-pound capacities. Request a quote on the mounting hole zip ties you need, or contact Cal Fasteners to learn more.